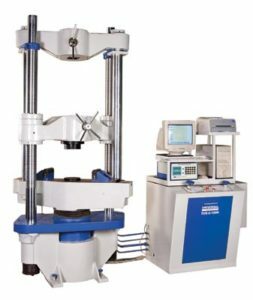 A machine used to test specimens for tensile strength, compressive strength, shear strength and to perform bend test along other important laboratory tests. The primary use of the testing machine is to create the stress strain diagram. Once the diagram is generated, a pencil and straight edge or computer algorithm can be used to calculate yield strength, Young’s Modulus, tensile strength or total elongation.